Glaucoma is part of a group of diseases of the optic nerve involving loss of retinal ganglion cells in a characteristic pattern of optic neuropathy. Raised intraocular pressure is a significant risk factor for developing glaucoma (above 22mmHg). One person may develop nerve damage at a relatively low pressure, while another person may have high eye pressure for years and yet never develop damage. Untreated glaucoma leads to permanent damage of the optic nerve and resultant visual field loss, which can progress to blindness. Glaucoma can be divided roughly into two main categories, “open angle” or chronic Glaucoma and “closed angle” or acute glaucoma. 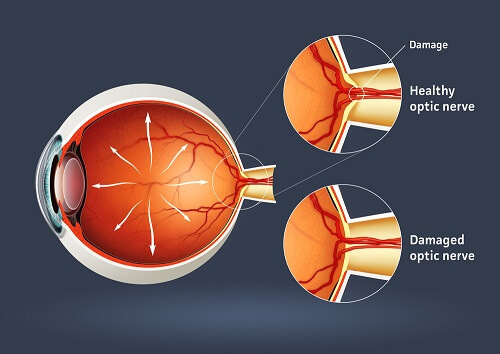 Angle closure, acute glaucoma appears suddenly and often with painful side effects and so is usually diagnosed quickly, although damage and loss of vision can also occur very suddenly. Open angle, chronic glaucoma tends to progress more slowly and so the patient may not notice it until the disease has progressed quite significantly. Glaucoma has been nicknamed the “sneak thief of sight” because the loss of visual field often occurs gradually over a long time and may only be recognized when it is already quite advanced. Once lost, this damaged visual field can never be recovered. Worldwide, it is the second leading cause of blindness. Glaucoma affects one in two hundred people aged fifty and younger, and one in ten over the age of eighty.